Kumu Blair Sataraka, right, and Sammi Pedro perform nearly all of the music during the Hui 'O Kamalei 30th Anniversary Hula Show at the Hilton Hawaiian Village. THE HULA LEGACY Kamalei Sataraka left behind continues to flourish. Before she died from a stroke last year, she told her hula halau to remember one thing: "She said when we dance, no make her name shame," said son Blair Sataraka. The halau Hui O Kamalei shows continued last week during its 30th anniversary performance and tribute to Kamalei Sataraka at the Hilton Hawaiian Village. The halau performed a Tahitian disco dance with a 19-song medley as a tribute to the past and present of the halau's rich history. The task of moving the halau forward has taken time and effort. Blair Sataraka's full-time job as a city bus driver meant spending the rest of his free time teaching and staying at the Makiki studio until midnight. "You wouldn't believe how many people it took to fill my mom's shoes, and I still don't believe they're completely filled yet," the 32-year-old Sataraka said. His mother taught everyone in the halau from age 3 to 90, but her natural patience made working with toddlers her favorite part of hula. "She loved those babies and always knew how to make them laugh," said best friend Gloria Synder, who is continuing to help with the halau. Keoki Ehia and Blair Sataraka arrange the numerous trophies, bowls and accolades collected by kumu hula Kamalei Sataraka throughout her 30 years of teaching hula. Former dancers returning with their children was a welcomed surprise for Blair Sataraka since he thought dancers would leave with his mother's death. Everyone remembered Kamalei Sataraka, 58, as being a comic hula dancer and kumu, so meeting expectations by the audience and students proved to be a challenge for her successors. Rubber chickens, dancing menehune, baby dolls and Chinese lions crowded the stage during a typical performance, which her son believed made for a good show. "I never realized how much she knew," her son said. He recently began reading some of his mother's books on hula history, bringing books with him to the bathroom and even to work on the bus. Momoko Watada, from Japan, performed "Hui Hula O Leialoha" during the Hui O Kamalei 30th Anniversary Hula Show. "I know how to dance, but I don't know the history too well," he said. "It's important to know, especially since we're trying to steer this ship." 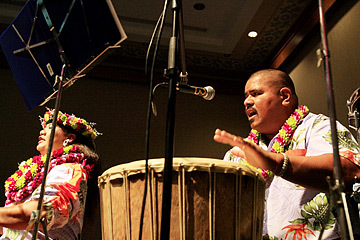 Halau musician Sammi Pedro learned how to play the Tahitian toere drum upon Kamalei Sataraka's death. "We needed to do this and get over any hump that comes our way," Pedro said. "I hope she's proud to know that we're carrying on her name just the way she left it."